Friday’s my 400th article, so if you don’t mind, I’d like to take a moment and talk about my favorite topic: myself. If I average 600-700ish words per article, that means I’d have written a thousand page book in these past two and a half years. And as I start the slow climb to my next 400, know that every article and every topic I cover is something I love. If I don’t like a comic, I don’t talk about it. So as we continue our comic journey, please remember these two things: negativity is soul-crushing and a celebration of comics will always be superior to a criticism. That said, you have every right to judge, etc. etc., and I adore every one of my readers — especially you. Oh, and before we begin, have you visited my dear friend’s comic book blog The Speech Bubble? He works far harder than I do and deserves more acclaim than he’s seeing. 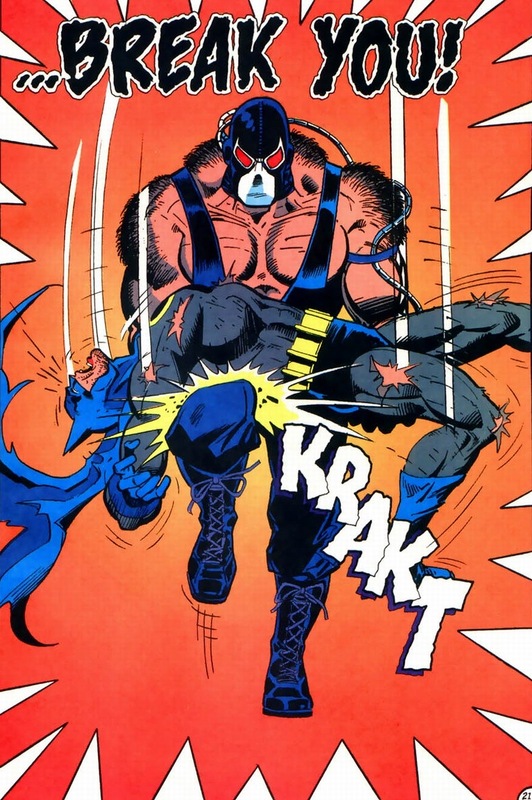 Okay, so you know about Bane breaking Batman’s back during the Knightfall event. It’s super famous. But have you ever actually read the comic itself? If you have, then you can skip today and go watch YouTube videos. But for those of you who haven’t, it’s amazing. Like a brilliant diamond in the midst of the mullets and extreme ‘tudes that littered the 1990s. We’ll read it together, because like Watchmen, The Dark Knight Returns, All-Star Superman, and others, it’s just something you should have to read to be a well-versed comic book fan. 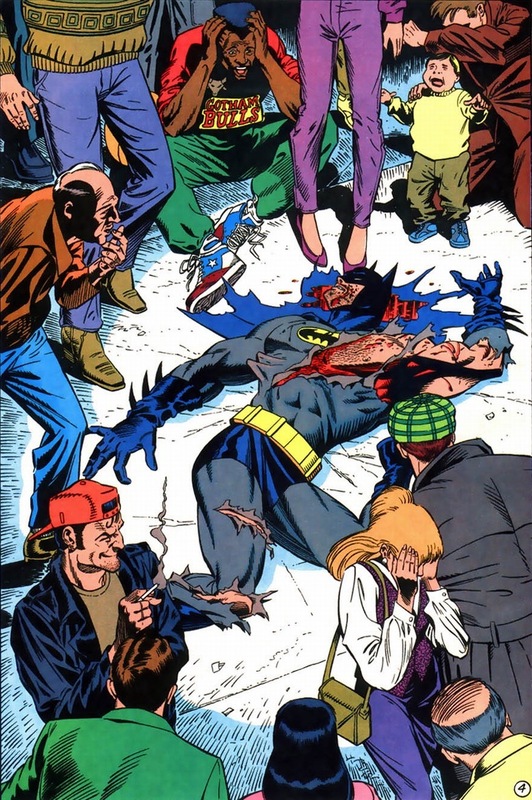 Today, enjoy Batman #497, written by Doug Moench and drawn by Jim Aparo as well as Detective Comics #664, written by Chuck Dixon and drawn by Graham Nolan. To fully appreciate this story, you have to know some of the backstory. 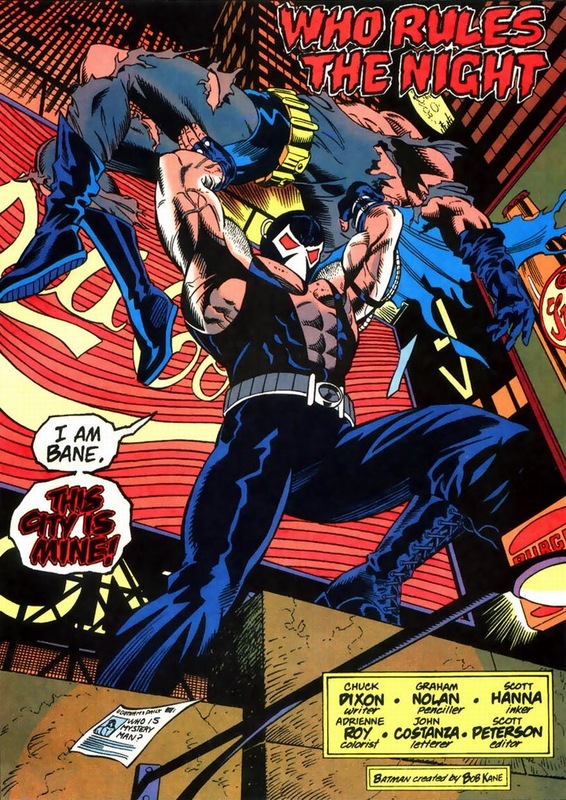 Bane first appeared in 1993, about six months before our story today. 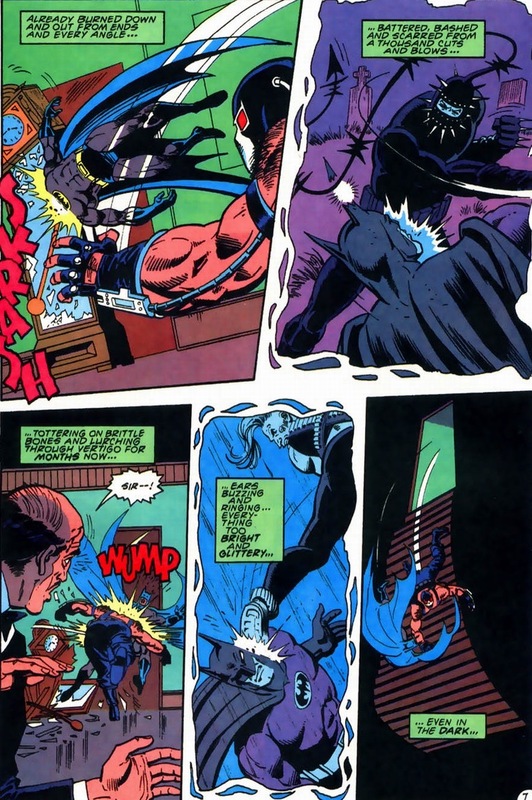 Psychopathic, certified genius, and incredibly strong (even more so on his venom stuff), he decides he wants to destroy Batman. 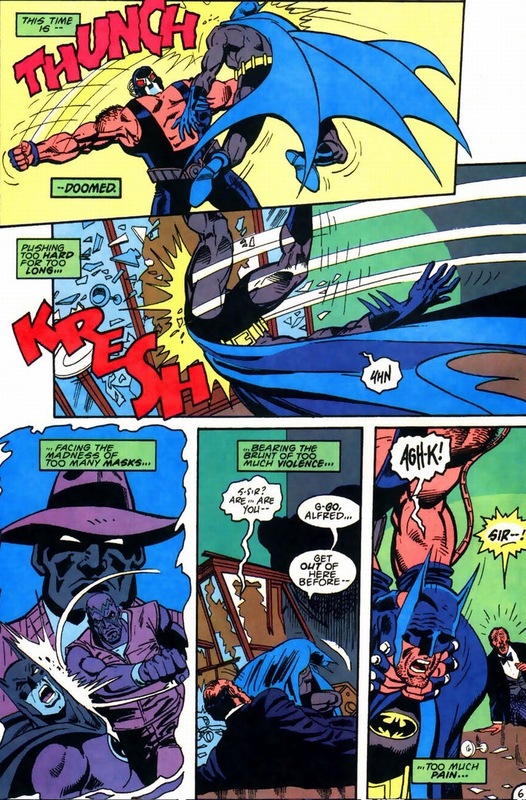 Y’know, because if Batman’s the strongest, then that’s who he has to beat. 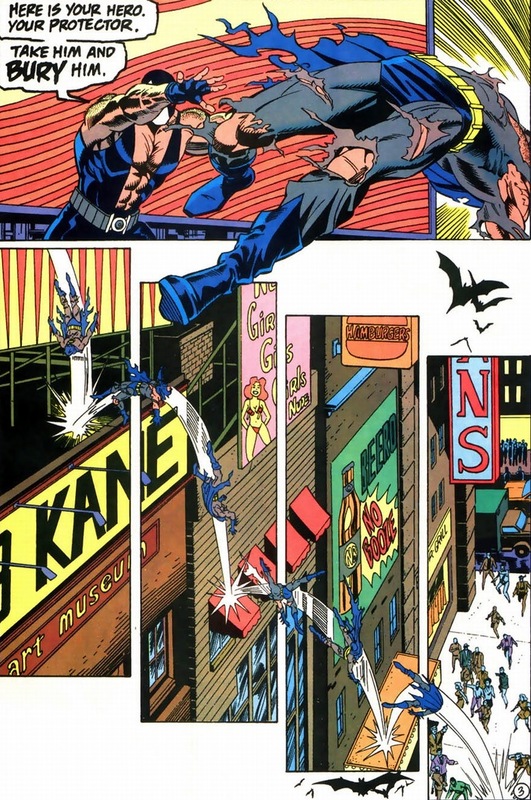 But instead of just jumping down from a warehouse rafter for a surprise fistfight, he unleashes Batman’s entire rogue gallery to play in the streets of Gotham. The Dark Knight spends months hunting down each of his supervillains getting weaker and weaker with each new baddie takedown. 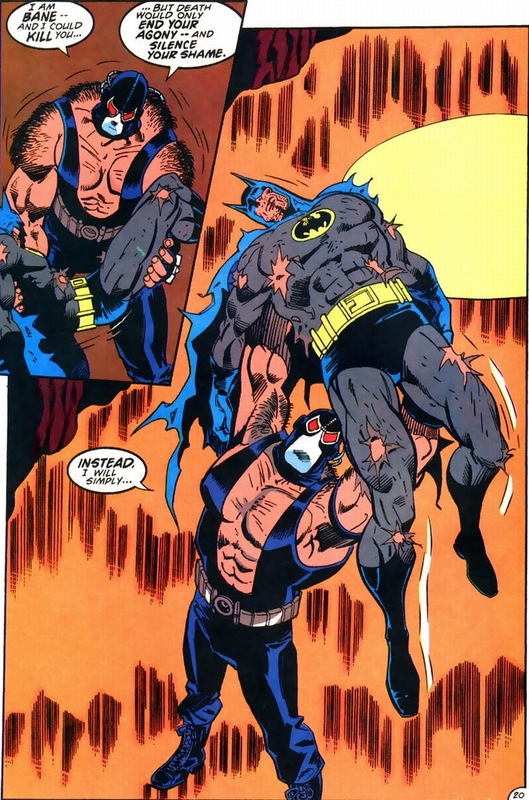 When Batman finally re-captures them all, at his absolute worst physically and emotionally, then Bane ambushes Batman. I’m not spoiling anything by saying Batman loses. 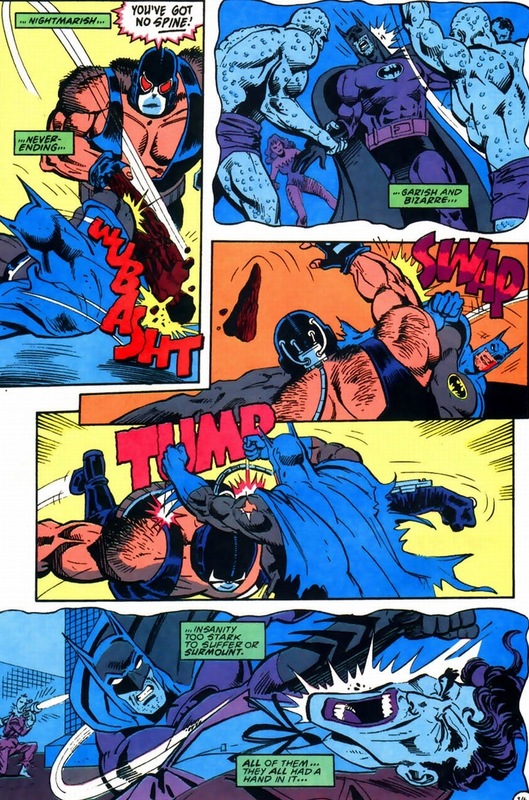 And it’s not the sheer brutality of the beatdown that makes this fight worth reading. Batman knows he holds a major disadvantage. 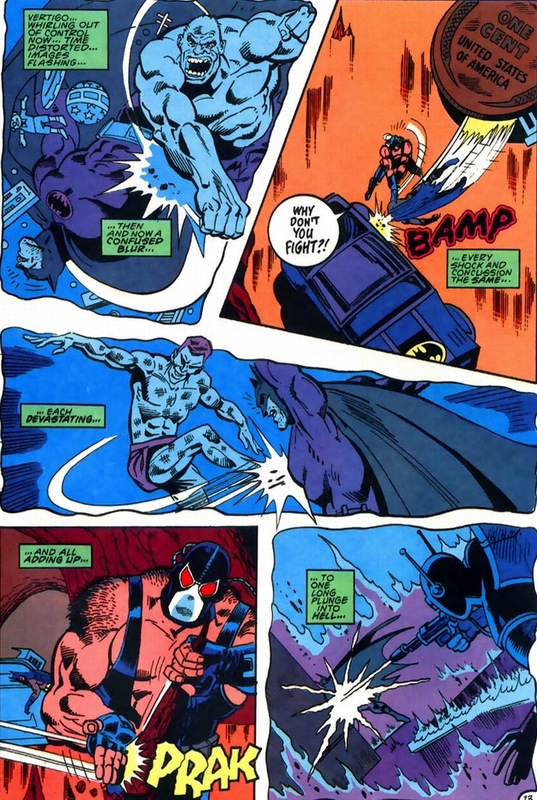 The beauty comes in him re-living these disadvantages (along with the poetic text boxes) as Bane punches the everloving crap out of our dear hero. That even for Batman’s unbreakable morality — good always triumphs over evil and always will no matter how bleak or desperate — he’s still just a man. And this issue comes less than a year after The Death of Superman. If Superman can lose, what chance does our poor Batman have? 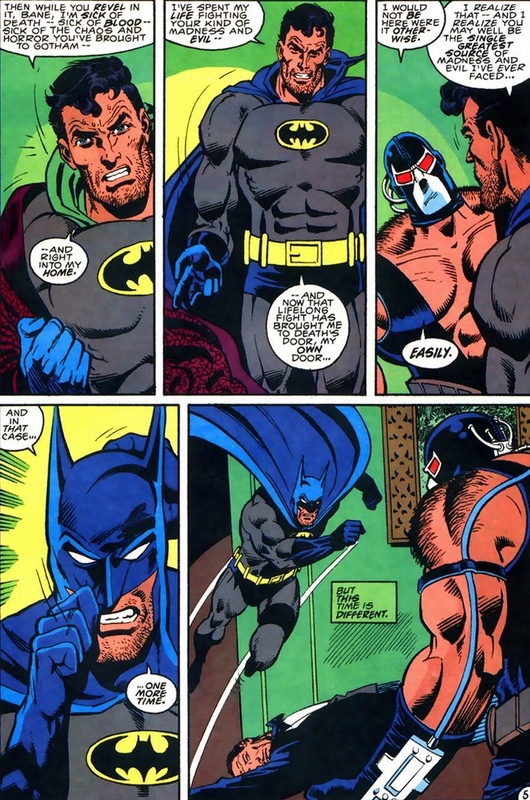 Bane is Batman’s Doomsday. He represents the basic idea that despite every push we make to eternally fight evil, something or someone will always rise up to shatter our collective efforts and show us our own futility. Or in other words, the summary of every major news story of 2014. 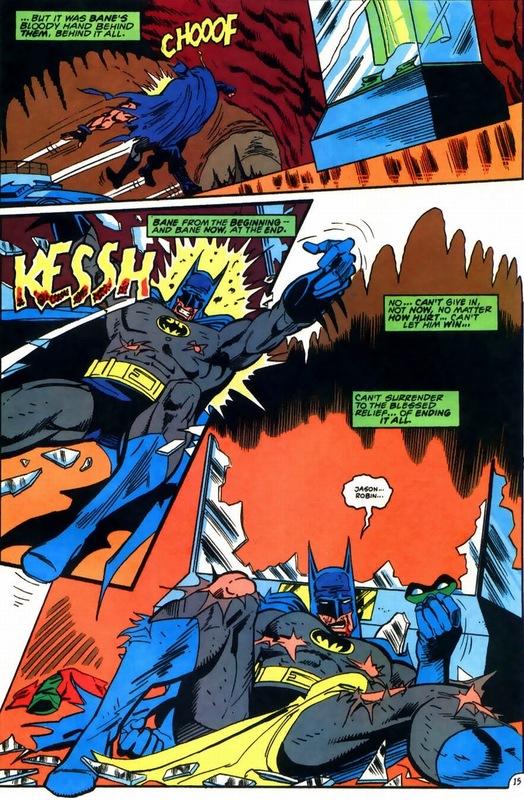 I’m not being cynical — Superman never loses to Doomsday again and Batman defeats Bane in every encounter after this. It’s just that sometimes we need to be reminded that evil packs a wallop and just like Batman, we have to rise up time and time again, no matter how many stalagmites we’re thrown into. Sorry for the sermon, I’m not religious, so superheroes fill that void in my life. And by that I mean I pray to Spider-Man every night. 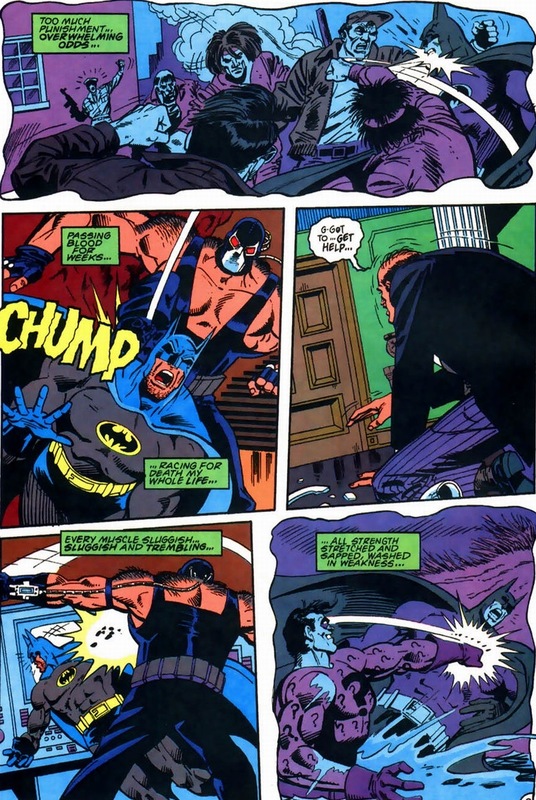 Each flashback goes back to another issue and another bad guy Batman had to subdue in the chaos Bane let loose. 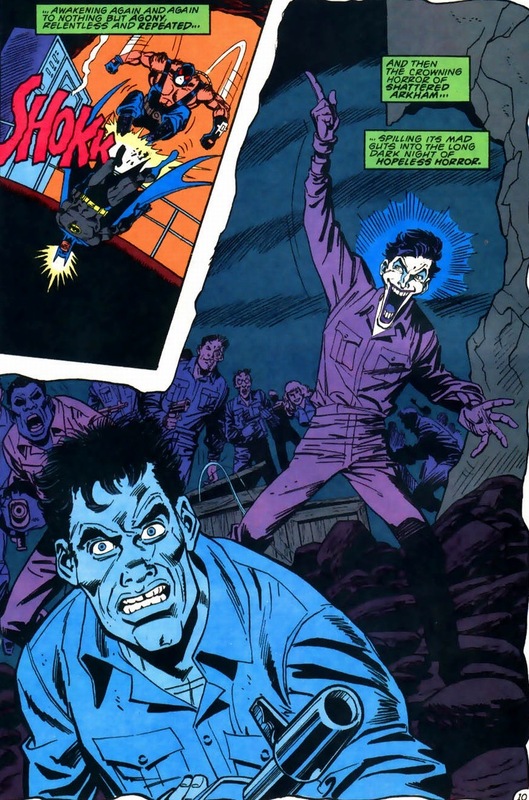 On a very much unrelated note, a few issues from now, Scarecrow sprays his fear gas on Joker to determine his greatest phobia. The answer? Nothing. The dude’s fearless. And then he beats Scarecrow with a chair. I’ve always wondered — how did Batman get that huge penny into the Batcave? He can’t call movers or anything and it’s not like it’ll fit in the trunk of his Batmobile. The T-Rex too, while we’re at it. But then again, I accept without question that a middle-aged man spends his whole life in a blue and gray bat costume while leaping from rooftops to karate chop giant alligator men and clay monsters. 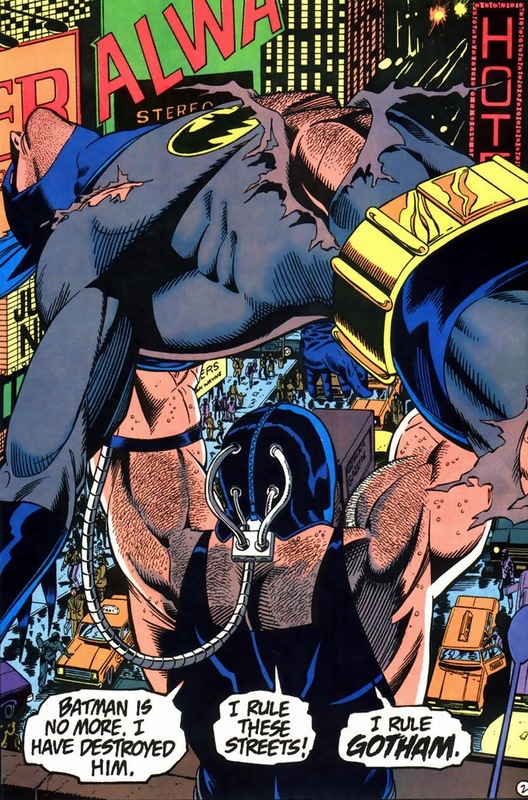 Also, and on a more important note, does Bane claim the title of the supervillain rockin’ the most back hair? A broken bat may be damaging enough, but Bane goes a step further. When wrestlers win the championship belt from their opponents, they don’t just shake hands and walk away. No, now comes the gloating. Let all of Gotham City know that they answer to a new authority — a hairy, venom-addicted, monster of a manbeast. 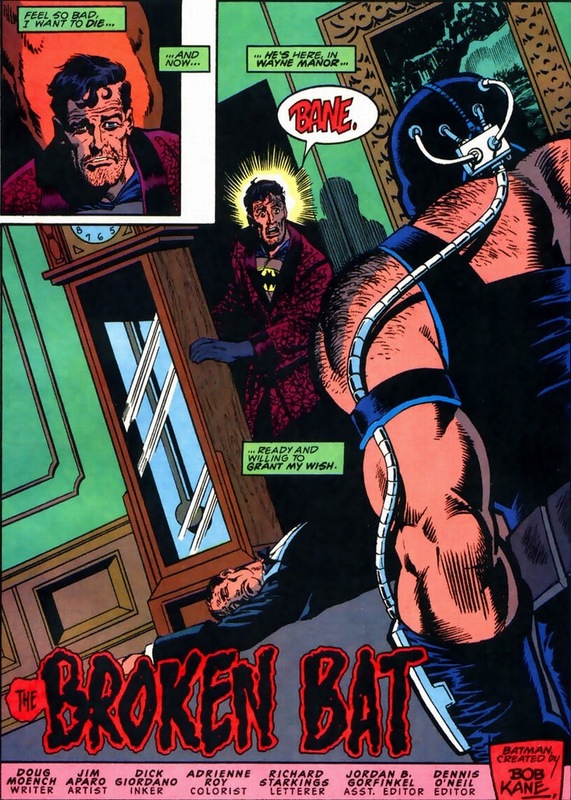 On Friday, it’s Azrael versus Bane! Our Knightfall battles continue! It’s been a while since I read this. 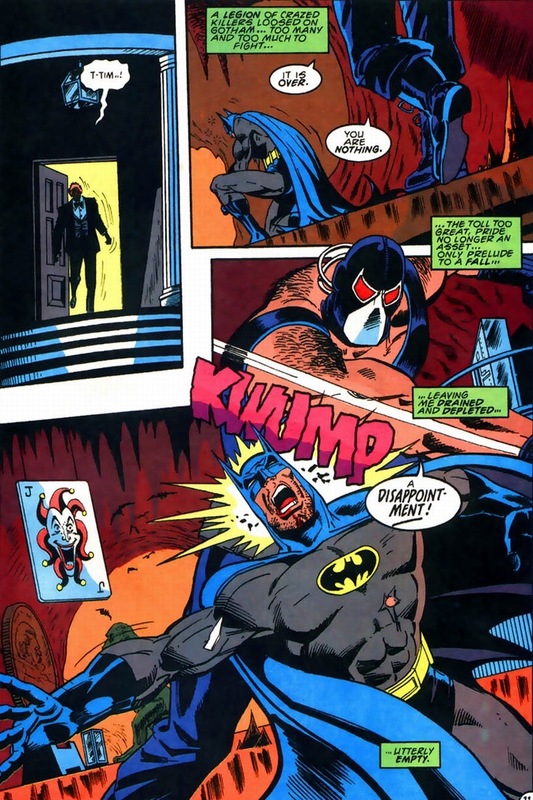 I realize how much I miss aparo on batman. 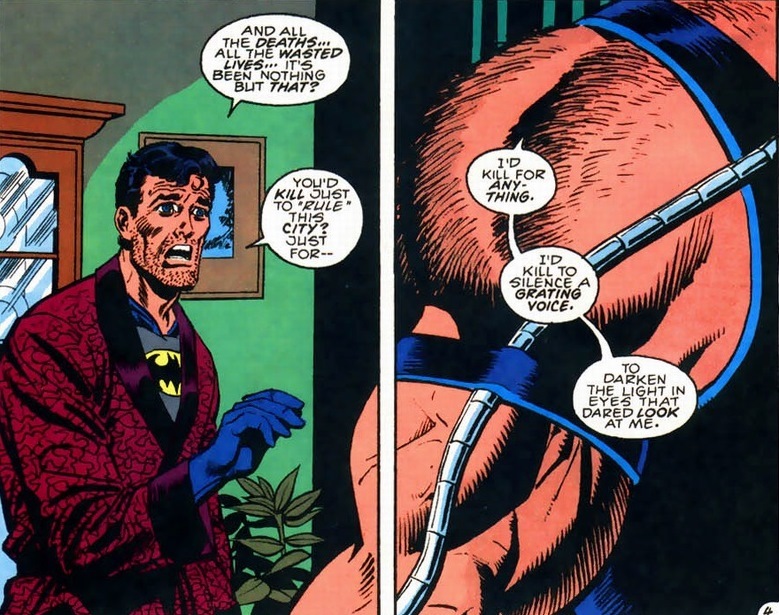 This story did bother me in the sense that Bruce was exhausted. 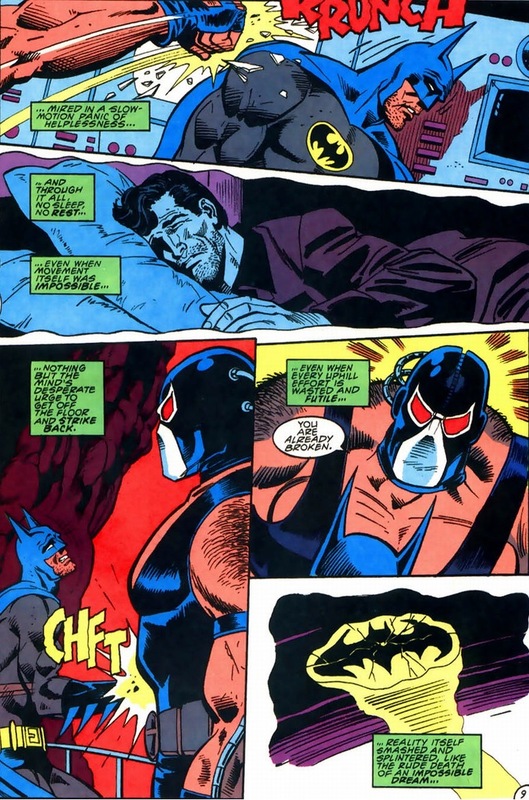 You’d have thought bane would have wanted him fresh to prove his superiority. Unless they were going for coward at heart. BTW I’m late to your blog but find myself looking forward to new articles. Thanks for doing it.